Riviera Mayabeaches are considered by many people to be some of the most beautiful beaches in the world, not only for their soft white coral sand and crystal clear turquoise water, but because they cover 120 coastal kilometers, including coves, capes and bays. The Riviera Maya offers a variety of beautiful natural scenery. These are the reasons we have chosen the top 6 beaches that you can´t miss on your next visit to the Riviera Maya. 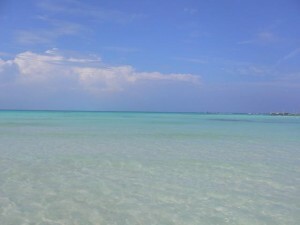 Located in the Riviera Maya only about 25 minutes (11 miles) south of Cancun´s International Airport is Puerto Morelos. It is a bohemian town and very different from the crowded cities of Cancún and Playa del Carmen. In Puerto Morelos you will hear different languages, due to the multinational residents, such as: English, Dutch, French, German, Swiss, Italian, Maya and of course Spanish. 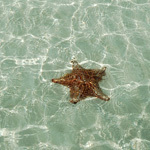 On your stay here, we recommend you visitthe National Marine Park,an ideal place to snorkel and dive. For adventure lovers, you won´t need to look further because Puerto Morelos offers plenty of ecotourism excursions such as bicycle tours, jungle canopy zip lining, and the opportunity to explore “cenotes”, natural sinkholes, nearby. You will be amazed by the beauty of Puerto Morelos! Also known as “playa del sur”,this beach is a calm, peaceful spot situated between Puerto Morelos and Punta Maroma, just 30 minutes from Cancun and 15 minutes from Playa del Carmen, it´s located in the heart of the Mexican Caribbean, with many beaches and virgin coves to the north and south. There are many activities available: aquatic sports such as waterskiing, sailing, fishing, and swimming with dolphins; and land activities like golf on courses with fascinating ocean views and jeep safaris or horseback riding. At night there are also many bars, pubs and restaurants to enjoy. Warm crystal clear Caribbean seas and soft white sand makes Playa del Secreto one of the most gorgeous beaches in the Riviera Maya, located only 48 km south of Cancun. The road that leads you to Playa del Secreto winds through mangroves, local wetland trees, where hundreds of species of tropical birds can be seen. There is a small community of houses and even one hostel but in general there is nothing but blue skies and crystal water along a lonely beach, where it is still possible to see the wonderful and unique event of turtles laying their eggs. Witnessing a turtle being born or making its first trip into the ocean is an unforgettable experience that takes place on Playa del Secreto. Considered one on the top beaches in the world, located between Puerto Morelos and Playa del Carmen, Playa Maroma is a calm tranquil beach. Playa Maroma´s cove is a crystal clear water pool ideal to dive or snorkel and explore colorful reefs, or swim with dolphins. We would also like to mention that between Punta Maroma and Punta Bete you can find “Tres Ríos Nature Park, which boasts three rivers of fresh crystal subterranean water, and ten cenotes that you can enjoy with your family. 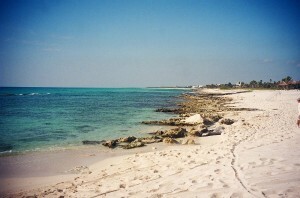 Located 4 kilometers north of Playa del Carmen off highway 307 is Punta Bete. Stunningly beautiful and with relaxing, calm seas, this is the ideal place to snorkel the reef that´s situated very close to the coast. During your stay rent a cabaña or try camping on the beach for a unique experience. Punta Bete has rustic restaurants and lovely scenery, and you can also visit the little archeological site situated on this beach. If you stay here, remember to ask for the grilled lobster like the locals, it´s simply delicious! Another great place you can visit is Xcalacoco, which means “twin coconuts” in the Mayan language. 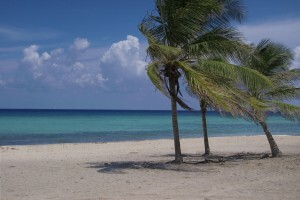 This beach is located just a few miles from Playa del Carmen. It is believed that the area was a commercial port for the Mayas and that the name comes from the fact that there were many coconut trees in the area. 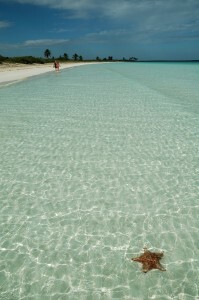 Today it is just awhite sandy beach where you may find a few Mayan ruins. This is a great place to camp as you can find services like showers and restrooms. There are some small restaurants on the beach, where the grilled garlic fish and the Mayan specialty of the region “Tikin-Xic Fish” (fish in a Mayan sauce made with achiote) are both very popular.